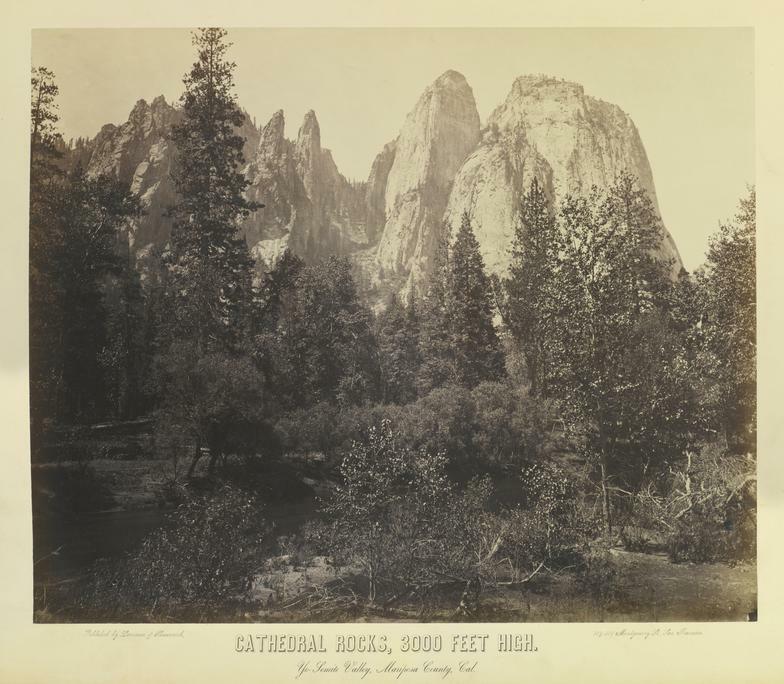 Weed, who moved west to Sacramento, California, in 1854, made his first photographs of the Yosemite region in 1859. His mammoth-plate views of the valley however, were not made until 1865, possibly with Eadweard Muybridge working as his assistant. Employed by Lawrence and Houseworth, a photographic publishing firm, Weed produced views for a growing audience of tourists who had been exploring the Yosemite Valley since the mid-1850s. Weed's photograph of Mirror Lake, is, in fact, two landscapes: the sharp silhouette of mountain and tree line and a dreamier rendering of this subject reflected in the water. [Mirror Lake and Reflections …, SAAM, 1994.89.5] The sharp line of a dead tree branch defines the difference between "real" and "reflection." Both, however, convey the nineteenth-century reverence for sublime beauty.